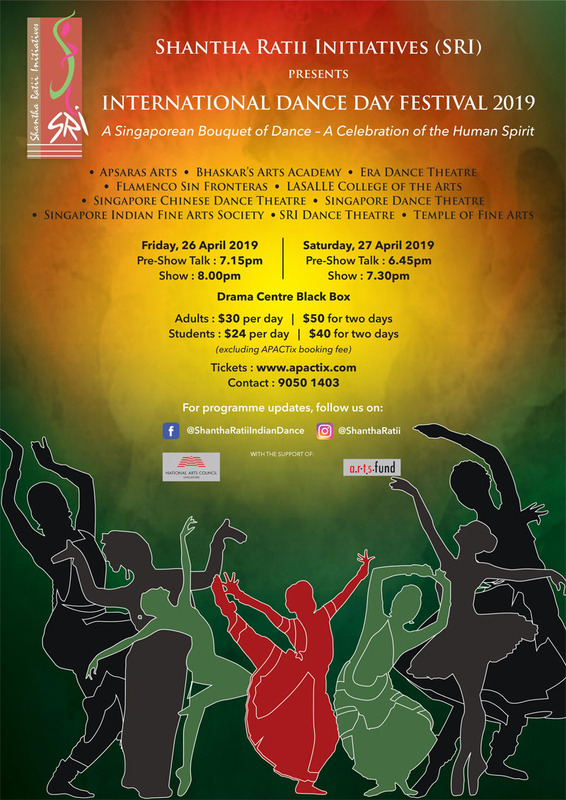 Shantha Ratii Initiatives (SRI) presents the third edition of International Dance Day Festival, in celebration of Singapore's rich tapestry of many distinct dance forms and Singaporean artistes from diverse disciplines. SRI perceives each individual dance form as a magnificent flower and this festival presents them together in a resplendent bouquet. The collaboration of these different and unique artistic expressions is ultimately a celebration of the human spirit! In this one-of-a-kind event you get to see the established and promising Singaporean dancers in their riveting display of Spanish, Western Contemporary, Chinese, Indian, Malay and Western Ballet dance forms. This year's theme, SPRING, exudes the qualities that spring eternally in the human soul; hope - the anticipation of all that is new and fresh, and the joy in reveling in renaissance and resurgence. The highlight for each day will be a dance dialogue between Flamenco, Bharatanatyam and Kuchipudi dancers. They will engage in a repartee of mathematically designed rhythms with intricate and exciting footwork to delight you! With the Pre-Show Talk we strive to equip you with insights into these magnificent forms. International Dance Day has been celebrated the world over since it was initiated in 1982 by the Dance Committee of the International Theatre Institute, UNESCO's main partner for the performing arts. It takes place annually on 29 April, the birth anniversary of the creator of modern ballet, Jean-Georges Noverre. We invite you to bask in the glorious beauty of dance with us! SRI is a non-profit organization that aspires to be creative, innovative, dynamic and inclusive in the field of art. It is helmed by Shantha Ratii, the multi-faceted dancer, teacher, choreographer, cultural activist and film maker.